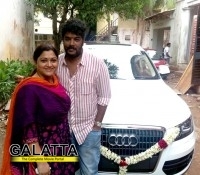 Khushbu gifts an Audi to husband Sundar C.
Khushbu a.k.a Kush and Sundar C. are one of Kollywood's most celebrated couples. And now the latest is that Khushbuhas gifted Sundar a white Audi. She has also posted a picture of them posing with the Audi on her social networking site.